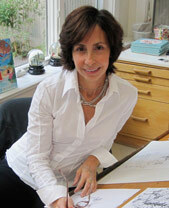 I am so glad to welcome author and illustrator Elise Primavera to Book Club Exchange. Yesterday, I reviewed her latest novel LIBBY OF HIGH HOPES which is just fantastic for middle grade readers. I am very excited about Ms. Primavera's post because not only is it about book clubs, but it is about mother/daughter book clubs, a subject very near and dear to my heart. When I was asked to do a guest post for my new book Libby of High Hopes I jumped at the chance to tell readers that it would be perfect for their mother/daughter book clubs. Libby of High Hopes is about the summer in the life of a young girl taking her first steps into the world of horseback riding. It’s also about that moment in childhood when anything is possible; becoming a prima ballerina, an astronaut, or in Libby’s case, the best rider in the world. The skies the limit of who she might be in the future. The problem for Libby is just who she is now. The book begins at the end of fourth grade when she receives a comment from her teacher saying that, “Libby needs to live up to her potential.” Libby wonders at first what is potential? In the dictionary she sees it defined as: “Expressing possibility, something that can develop or become actual.” Expressing possibility? What kind of possibilities? How can she live up to her potential, she wonders, if she doesn’t even know what it is? It’s at that point in the story that she discovers High Hopes Horse Farm and tries to do what her fourth grade teacher suggests. We hope that girls will make goals and go as far as they can towards achieving them. We hope that they will explore their talents and not be afraid to find out their strengths as well as their weaknesses. Libby of High Hopes is a book about a girl who loves horses and wants nothing more than to become a great rider, but it’s also about enjoying the journey. Libby has a strong vision of who she wants to become but the story is also about being content with the girl she is now. The book also speaks to that thing that happens between girls when they both try for something and one is better than the other at it. Libby’s mother is a runner. She’s also best friends and runs with a woman who has a daughter Libby’s age, named Brittany. From Libby’s perspective is seems as though Brittany is good at everything. There’s a part in the story where Libby’s mom encourages her to join the swim team that summer. Libby is not a strong swimmer and to make matters worse Brittany is. So Libby doesn’t want to swim anymore. She only wants to ride horses. Then one day she walks into the barn only to find out that Brittany has invaded her territory and is going to take riding lessons as well! Libby feels pressure to compete with this girl who everything seems to come so easily to. She worries that maybe her mother wishes she had a daughter more like Brittany. I think this is a common theme and a subject that could be discussed after reading about how Libby deals with it. All these ideas are timeless; potential, trying our best, supporting each other, and when things don’t go our way, drawing on our inner resources and making things happen on our own. Libby of High Hopes presents them in a format that is easy to understand for young readers and would make for great conversation between moms and their daughters—or even their sons for that matter. Elise Primavera has illustrated more than twenty books for children, several of which she also wrote, including the New York Times bestselling Auntie Claus as well as Auntie Claus and the Key to Christmas and Auntie Claus Home for the Holidays. Other titles include Plantpet, a Parents Magazine Best Book and she illustrated Raising Dragons by Jerdine Nolen which received a 1999 Christopher Award, the 1999 Irma S. and James H. Black Award for Excellence in Children's Literature from the Bank Street College of Education, and an Oppenheim Toy Portfolio Platinum Award. Newsweek, Sesame Street Parent's magazine, and Smithsonian Magazine selected the book as one of the best of 1998. Most recently Ms. Primavera has authored Louise the Big Cheese: Divine Diva and Louise the Big Cheese and the La Di Da Shoes both illustrated by Diane Goode. Elise Primavera lives in New Jersey. Visit her at eliseprimavera.com. A huge thanks to Ms. Primavera for participating in Book Club Exchange! If you are interested in participating in a future Book Club Exchange, please contact me at bookingmama(at)gmail(dot)com. I wish I had a mother-daughter book club to read this book with! It sounds terrific to me! Oh that relationship between Libby and Brittany sounds so real. I wish my niece were younger ... this is just the type of book we used to read together.